As a photographer, I like to question everything. I like to understand how things work, why they are how they are, and how it affects what I do. One of my latest ponderings really got me thinking, so I ran it past US based photographer Chase Jarvis for his opinion. Not only did he have his own take, but he also felt compelled to post the question on his blog. I found some of the comments really quite interesting, so thought I would pass on some of my own thoughts. Firstly, as a fashion photographer, I shall be relating this mainly to shooting people/models, but the same could apply to a landscape, bride and groom or a product. The most important thing in a photograph is the subject. It's the subject that inspires you, and the subject that is the starting point to the creative process. When someone views a portrait, they should say "she (or he, that, them etc) looks beautiful" rather than "that's an amazing photo of her". People will look past the image and see the subject if the photographer has made the image less about them, and more about who or what's beginning photographed. It's the subject that should come first. When I first started as a professional photographer, I often questioned what it meant to be 'professional', and what people and, more importantly, clients expected. For a long time I overcompensated with gear and lighting. I would light virtually every scene in order to create a "look". The resulting images were actually more about me than my subject. There are many occasions when you must absolutely remove yourself from an image. If you're trying to capture a moment or a scene that is nothing to do with you for example. To get too close to the subject or interact in some way would disrupt the integrity of the shot. Annie Leibovitz is a photographer who researches her subjects with immense precision. This research can be anything from reading their biography, watching or looking at their work, to, when possible, watching them on a daily basis go about their life. She tries to capture a little piece of their soul within a photograph. The photographs she produces are not about her. They're about her subjects. When touring with the Rolling Stones, early in her career, Leibovitz got to a point where the band would ignore her as she wandered about capturing them with her camera. This meant that she was able to get right inside the band and photograph them in a way that is rarely seen. Another interesting fact is that she often doesn't talk to her subjects while shooting. She says, “I certainly can’t talk to people and take pictures at the same time. For one thing, I look through a viewfinder when I work.” By taking this approach, her subjects are being themselves, rather than who the photographer wants them to be. 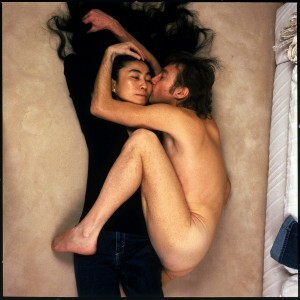 This was further emphasised when she photographed John Lennon and Yoko Ono, shortly before Lennon was shot. The pose was entirely John and Yoko's doing. Leibovitz recalls... "Then he curled up next to her and it was very, very strong. You couldn't help but feel that she was cold and he looked like he was clinging on to her. I think it was amazing to look at the first Polaroid and they were both very excited. John said, 'You've captured our relationship exactly'. Removing yourself from the photograph enables you to capture the essence or soul of your subject. When creating a photograph, you need to put your stamp on it. If you don't, someone else could easily produce the same image, and if they can do it cheaper, you might as well give up and go home. You want people to book you for how you do what you do, not because you were cheap and available. Your images should be easily identifiable as yours, whether it be by lighting style, subject choice or composition. By interacting with a subject or scene, you're changing it from something any bystander could see, into something you have created and only you can capture. In 1957, Richard Avedon photographed the Duke and Duchess of Windsor, formerly King Edward VIII and his wife Wallis Simpson. The Windsors were very practiced at putting on happy faces for the camera and Avedon knew that. Since the Duke's abdication from the throne, the pair had been photographed many times and had got their posing and happy, smiling, camera faces well practiced. Avedon didn’t want that kind of standard photo of them though. He wanted to show a different side. A side that no one ever sees. He knew that the Windsors were avid dog lovers and would use this to his advantage. After getting the shot all set up, with the Duke and Duchess in position, he told a deliberate lie. He explained how on his way to meet them, his taxi had accidentally run over a dog in the street and killed it. The moment they heard this, their faces dropped, and Avedon clicked the shutter. The result was a shot completely unique to Richard Avedon. If he hadn't interacted with his subject and put a part of himself in the image, it would have been the same photograph as everyone else's. Your photographs should be all about you. Only by imposing yourself on a subject can you create something unique to you. So the way I see it, this is largely a question about confidence and ego. Many photographers, especially at the beginning of their careers put far more effort into 'their style' through trying to be different, original and unique. Style is something that develops, changes and evolves over time. It shouldn't necessarily be a conscious thing. It should be the natural way you approach the photographic process. Being a photographer is much more than knowing how to operate a camera, lighting or photoshop. Its about seeing, telling stories, engaging with a person, people or place. You need to put your subject first. Your subject is more important than you. If you disagree, maybe you should ask yourself why you chose that subject. If the photographer is the most important thing, why do we not only ever shoot self portraits? There are plenty of photographers out there with highly inflated egos. In their world, they are the star. They create the magic, and need to have their stamp on everything in order to tell everyone that it's their work, and they did it, and that they're the most important part of the process. They might be right... But I see things as more of a collaborative process. The vast majority of my work involves other people. Models, make up artists, assistants, stylists, designers all play their part. A model can inspire me in the way they move a certain way. A stylist can create a look which inspires the model to move in the way that inspires me. The designer created the clothes that the stylist put on the model, in order for her to move in a way that inspired me. Everyone plays their part, and I personally don't need my stamp on absolutely everything in order to make an image my own. It's about seeing what's in front of you and using it to capture the ideas that running through your head. There's so much more to style than lighting setups and editing. Henri Cartier-Bresson, one of the greatest photographers who ever walked the streets of the world, never developed any of his own prints. His photographic style was based purely on what he did with the camera. Many of the magazines I work for have their own retouching departments, so I quickly learned that my style cannot be based on retouching, or photoshop "effects" if I want to continue to work commercially. Sometimes, there isn't time to work with extensive lighting setups, so my images need to be defined by more than how many flashes I've used. By taking all of these elements out of the process, a professional photographer then has to rely on the skill of knowing where to stand, pointing the camera in the right direction, and choosing when to click the shutter. This is the stuff that can't be copied. This is what makes your work unique and leaves your mark on the image. The beauty about us as people, and not just as photographers, is that we're all different. We've led different lives and had different experiences. We're all inspired by different things. We approach everything we do in our own way, without even thinking consciously about it. Everything we've seen, done and experienced up until this point right now, will be affecting the choices and decisions we make from this point forward. The work I'm doing today is different to the work I did a week ago, and different to the work I'll do in 20 years time. So in reality, it's physically impossible to remove yourself totally from an image, because even the idea of creating that image at that moment in time is something unique to you. So as Chase said in his response, you need to be "present" in the image, but you need to realise that it's not about you. By choosing to create that image, or shoot that subject, you're already putting your mark on it. By clicking the shutter at the moment it felt right for you, you made the image yours. The photograph is not about you, but by the very definition of you being the photographer who shot it, it's all about you.